If there’s an online casino bonus you want to claim, but your credit or debit card isn’t working – or you don’t want to enter your card details – you can opt for Flexepin. It is a prepaid option which has only recently emerged and Australian players can find it at retail outlets to use at participating online casinos with incredible welcome bonuses. Flexepin isn’t as common as Neteller or Skrill, but it is fast becoming more widely available. A subsidiary of Flexewallet, which is an online wallet service based in Western Australia, Flexepin has only been made available to just Australian and Canadian residents, but there are plans to roll the service out across Europe as well. We highly recommend Flexepin for Australian online casino players looking for a secure deposit option, since it is readily available at hundreds of outlets around the country. The voucher is exactly the same as the prepaid method paysafecard – it has 16-digits which you enter at an online casino to deposit the pre-loaded funds. However, there’s the option to pre-load more funds onto a Flexepin voucher than what you can on a paysafecard voucher and you can re-use the same voucher by topping it up. While not available to buy online, you can head to the Flexepin website and search for your nearest retail outlet. You can buy a voucher with a minimum of $20 loaded, or opt for the $30, $50, $100, $200, $300 and $500 options. You can buy up to 10 at one time, with a $5000 maximum limit. Once you’ve got your Flexepin voucher you can head to a participating online casino which accepts it as a deposit option. We recommend Royal Vegas Casino due to its secure encryption technology and solid reputation of offering fair games, good payout rates and fast cash outs. Royal Vegas also offers a $1200 welcome bonus you can claim when depositing with Flexepin. Sign up to the online casino if you haven’t already by entering a few details and confirming via an email, and then head to the cashier section to get started. Alternatively, check out our official review on RVC for more information before you make your final decision. 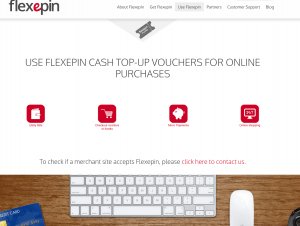 Scroll down through the payment options to the Flexepin logo and click on the ‘deposit’ link. The window will take you to the Flexepin page via Royal Vegas’s secure servers, and you can enter the 16-digit code and then confirm to complete the transaction. There is only one voucher option available to enter, so if you have more than one, you will have to follow the process again until you’ve deposited all the vouchers – but hold off until your second and third deposits if you are claiming the welcome bonus. You will automatically receive the welcome bonus of up to $250 matched by 100% on your first deposit. On your second deposit, you will receive up to $200 matched by 25%, and on your third up to $750 matched by 50%. Complete all three deposits to claim the welcome bonus; use three Flexepin vouchers over three deposits, or use just one but don’t deposit all the funds in one go – it is not disposable after one use, as you can leave funds on the voucher deposit a percentage or you can top it up. You will need to clear the bonus by wagering each matched deposit 40x and complete the three deposits within seven days, so you do not void the bonus. Claiming Internet casino bonuses are one of the best features to heading online instead of going to a land-based casino. But many can feel hesitant about entering personal and financial details on the Web. If you play at secure sites, such as Royal Vegas Casino, you don’t have to worry about this as the casino employs the latest technology to protect sensitive information. It is also regulated by the Malta Gaming Authority, so the great payout rates have been tested and confirmed. But some may still feel stressed by the prospect of putting these details online, so opting for a prepaid voucher which doesn’t have any personal information or even card details is a great option. It also means you won’t face any fees, which some credit and debit cards can face due to the financial institution deeming gambling transactions as Advance Cash transactions. Other banks in Australia also don’t accept gambling transactions at all so prepaid vouchers are a great alternative. It is important to note you can’t make withdrawals with Flexepin so you’ll need to opt for another method when cashing out. You can go with the web wallet services if your credit or debit card doesn’t work – or you don’t want to use them at an online casino.